There could be a huge rise in the UK's rat population as the rodents become resistant to poisons, pest controllers have warned. 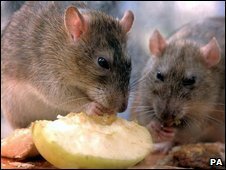 The British Pest Control Association (BPCA) said it has found two towns in southern England where rats are showing resistance to the chemicals used. It is urging the government to lift restrictions on two rodenticides which cannot currently be used outdoors. The association says rising rat numbers could pose a public health risk. The BPCA wants the Health and Safety Executive (HSE) to allow two chemicals, brodifacoum and flocoumafen, to be used outdoors saying the UK is the only country in Europe where this is not allowed. It says tests by the association in two unnamed towns - one in Berkshire and one in Hampshire - suggest rats are becoming resistant to poisons used. Further data is awaited. Initial results suggest there is wide resistance among the rat population to one of the rodenticides and pocketed resistance to another. BPCA chief executive Oliver Madge said: "We're putting down more and more of the two chemicals we can use outside and it's not working." Mr Madge said stronger poisons would not be more harmful to wildlife and the environment because much smaller quantities would be used and would only be handled by professionals. The HSE said the restrictions on the outdoor use of brodifacoum and flocoumafen were "due to the high toxicity of these chemicals and the risk of accidental poisoning of wildlife, especially predatory birds such as red kites and barn owls". However it said that where there were particular problems with resistance to other rodenticides, it would consider "limited outdoor use" of the chemicals in specific circumstances. It added: "The use of rodenticides is only one of the ways to control rats. "They should be used as part of a managed plan that should also include improving general hygiene, reducing nesting sites and proofing buildings." A survey for the National Pest Technicians Association found there were 378,000 local authority call-outs for rat problems in the UK between 2007-2008, up 15% on the previous year. Mild winters and wet summers have helped the population thrive. Areas where there has been flooding, such as Yorkshire, Oxfordshire and Gloucestershire, have seen an increase in rats forced out from sewers. The BPCA said waste food and composting encouraged rats as they burrow underneath compost heaps to make nests. Mr Madge said chicken wire across the bottom of compost bins could help. He also warned rats can transmit disease such as Leptospirosis or Weil's disease and chew through cables.